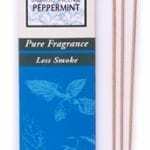 Sandalwood – Sweet, buttery aroma; Sacred & uplifting; 12 10″ Incense sticks. High quality resin incense on a stick. Resins are the purest form of incense that we know. Five hundred thousand years ago, our ancestors began to conquer fire and as they did so, they would toss various woods, shrubs, grasses, spices, oils, dried flowers, fruits, barks and tree saps into the fire. This was the beginning of using what we now call resins. The uses of resins can be traced back to the earliest written records of almost every culture in the world. The reasons for burning resins and incense are as varied as the different cultures which use them. Traditionally, the burning of resins is quite ceremonial and time consuming. At the least, a proper burner, charcoal tablets, an ample supply of heat, proper insulation and time are needed to provide the most pleasurable aromas. We wanted to go beyond the process of adhering resin on a blank stick of incense. We wanted the full impact of what the resin really smells like. Each of the resins goes through a five to six step process before it goes on the stick. The resin is then applied to the stick using essential oils. The final step is to hand roll the stick in ground resin. The process is complex and time consuming. What it gives to you is simplicity and pleasure. Each stick burns approximately 2 hours. Experience the art of burning natural resin simply by lighting a stick. Fragrance of Mimosa Nippon Kodo stick incense. Quality Japanese rolled incense. No wood in the centre. Comes with a tile stand. 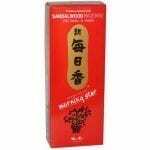 Fragrance of Musk Nippon Kodo stick incense. Quality Japanese rolled incense. No wood in the centre. Comes with a tile stand. 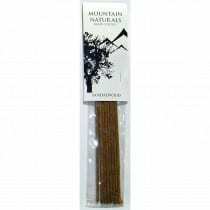 Fragrance of Cinnamon Nippon Kodo stick incense.Quality Japanese rolled incense. No wood in the centre. Comes with a tile stand. The highest quality Orange incense stick with less smoke by Nippon Kodo. Each bamboo stick burns for approximately 30 minutes. 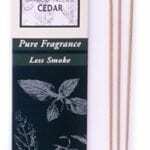 The highest quality Cedar incense stick with less smoke by Nippon Kodo. Each bamboo stick burns for approximately 30 minutes. Fragrance of Fig Nippon Kodo stick incense.Quality Japanese rolled incense. No wood in the centre. Comes with a tile stand. Fragrance of Nippon Lotus Kodo stick incense. Quality Japanese rolled incense. No wood in the centre. Comes with a tile stand.